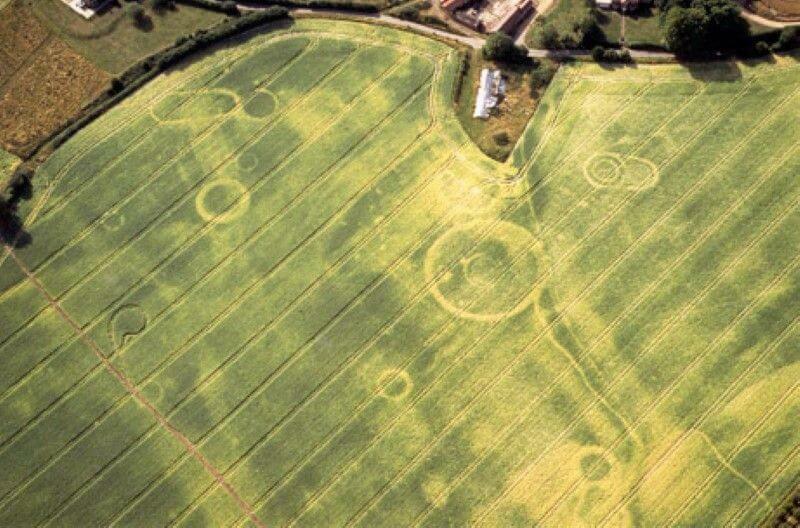 Given away by strange, crop circle-like formations seen from the air, a huge prehistoric ceremonial complex discovered in southern England has taken archaeologists by surprise. A thousand years older than nearby Stonehenge, the site includes the remains of wooden temples and two massive, 6,000-year-old tombs that are among “Britain’s first architecture,” according to archaeologist Helen Wickstead, leader of the Damerham Archaeology Project.For such a site to have lain hidden for so long is “completely amazing,” said Wickstead, of Kingston University in London. Archaeologist Joshua Pollard, who was not involved in the find, agreed. The discovery is “remarkable,” he said, given the decades of intense archaeological attention to the greater Stonehenge region. At the 500-acre (200-hectare) site, outlines of the structures were spotted “etched” into farmland near the village of Damerham, some 15 miles (24 kilometers) from Stonehenge (Damerham map). Discovered during a routine aerial survey by English Heritage, the U.K. government’s historic-preservation agency, the “crop circles” are the results of buried archaeological structures interfering with plant growth. True crop circles are vast designs created by flattening crops. The central features are two great tombs topped by massive mounds—made shorter by centuries of plowing—called long barrows. The larger of the two tombs is 70 meters (230 feet) long. Estimated at 6,000 years old, based on the dates of similar tombs around the United Kingdom, the long barrows are also the oldest elements of the complex. Such oblong burial mounds are very rare finds, and are the country’s earliest known architectural form, Wickstead said. The last full-scale long barrow excavation was in the 1950s, she added. The Damerham tombs have yet to be excavated, but experts say the long barrows likely contain chambers—probably carved into chalk bedrock and reinforced with wood—filled with human bones associated with ancestor worship. During the late Stone Age, it’s believed, people in the region left their dead in the open to be picked clean by birds and other animals. Skulls and other bones of people who were for some reason deemed significant were later placed inside the burial mounds, Wickstead explained. Other finds suggest the site remained an important focus for prehistoric farming communities well into the Bronze Age (roughly 2000 to 700 B.C. in Britain). Near the tombs are two large, round, ditch-encircled structures—the largest circular enclosure being about 190 feet (57 meters) wide. Nonintrusive electromagnetic surveys show signs of postholes, suggesting rings of upright timber once stood within the circles—further evidence of the Damerham site’s ceremonial or sacred role. Pollard, of the University of Bristol, likened the features to smaller versions of Woodhenge, a timber-circle temple at the Stonehenge World Heritage site. Damerham also includes a highly unusual, and so far baffling, U-shaped enclosure with postholes dated to the Bronze Age, project leader Wickstead said. The circled outlines of 26 Bronze Age burial mounds also dot the site, which is littered with stone flint tools and shattered examples of the earliest known type of pottery in Britain. Evidence of prehistoric agricultural fields suggest the area was at least partly cultivated by the time the Romans invaded Britain in the first century A.D., generally considered to be the end of the regions’ prehistoric period. The actual barrows and mounds near Damerham have been diminished by centuries of plowing, but that, ironically, may make them much more valuable archaeologically, according to Pollard, of the University of Bristol. The mounds would have been irresistible advertisements for tomb raiders, who in the 18th and 19th centuries targeted Bronze Age burials for their ornate grave goods. And “even if the mounds are gone, you are still going to have primary burials [as opposed to those later added on top] which will have been dug into the chalk, so are going to survive,” Pollard added. The contents of the Stone Age long barrows should likewise have survived, he said. “I think there’s good reason to assume you might have the main wooden mortuary chambers with burial deposits,” he said. An administrative oversight may also be partly responsible for the site remaining hidden—and assumedly pristine, at least underground—project leader Wickstead said. When prehistoric sites in the area were being mapped and documented in the 1890s, a county-border change placed Damerham within Hampshire rather than Stonehenge’s Wiltshire, she said. This lucky conjunction of plowing and politics obscured Damerham’s prehistoric heritage until now.